Old quarter of Kasbah, close to museums, the souk and the sea. Old house in the Kasbah, one of the oldest parts of Tangier, and renovated and decorated by an interior designer with traditional materials and comfort. Several terraces facing south, with beautiful views clear on the city, and the largest park in the Mandoubia and the Bay of Tangier. Within walking distance of museums, the souk, markets and shops, and the beach of the bay. Quiet, staff for the household and, if desired, preparing meals (small fee), central heating in winter. Each room has its own bathroom or shower. Six single beds convertible into three double beds. The house is close to a secure pay parking. Tangier is a great city at the junction of the Mediterranean and the Atlantic and overlooking the Strait of Gibraltar. It faces the coast of Spain which is only 14 km away and which we see the lights at night and villages and even the wind in good weather on the day. The sea is everywhere and brings a soothing summer breeze. Tangier has retained its charm and come here is to dive into another world, a world of beauty, kindness and surprises around every corner. It is necessary to experience the Souk full of wonders and where it is almost mandatory to haggle. 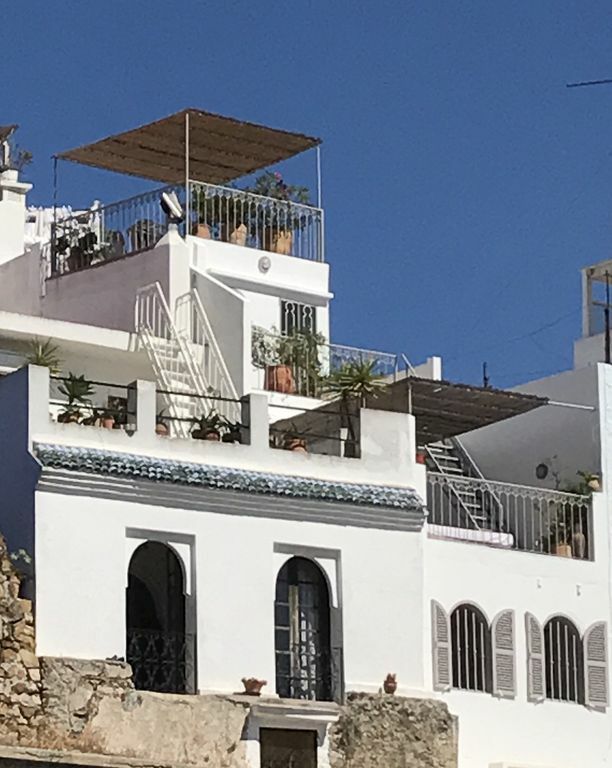 Do not miss the magnificent museum of the Kasbah and exotic garden, the American Legation, its small garden in the souk and its wonderful paintings, the Hafa cafe with breathtaking views of the sea and Spain. It should taste Moroccan cuisine with its abundance of spices, fresh fish that is eaten with fingers in outdoor restaurants at the fishing port. And of course, the summer, the beaches of the Mediterranean and the Atlantic offers the unique sand and waves. The bathrooms are covered with Moroccan tiles Fez (zellijs) and include either a fully tiled shower or a bath with shower, washbasin with a great plan hammered typical metal, and toilets (see photo). There is also a separate toilet with sink on the ground floor and upstairs to the dining room and kitchen. Towels provided (sheets and mattress protectors, pillow protectors and pillows, blankets, duvets, pillows, one small and one large towel per person, kitchen towels). The towels should remain in the house. You will find two small soaps and a roll of toilet paper in each bathroom upon arrival. Beach towels are not provided. The house comprises a ground floor and three floors. There MOREOVER two terraces with panoramic .. The bathrooms are fully tiled Moroccan zellijs and a shower, sink and toilet plan for both of them. The third has a bath / shower. The kitchen includes a large refrigerator with freezer, a gas hob, oven with hob, a microwave, a kettle and a juicer and a washing machine as well as an iron and ironing board. The counters are granite and the wall between the elements covered zellijs. The dining room overlooks a first garden terrace where you can have coffee and relax. The upper bedroom has a balcony planted. Above the upper room there is a large panoramic terrace planted. The house was an integral part of the experience of being in the Kasbah in Tangier. We arrived by boat and took a taxi to the El Morocco. It was 10 euro, probably too much. Call Amal to meet you. Otherwise you will not find the house. As advertised, it is multiple levels plus the roof top balcony. It is a mental challenge to remember where one has left things. The apartment, including the kitchen, is well equipped. We ate about half our meals in and the other half out. We were probably not fully prepared for as cold as it was, but that is Tangier in October. You will get many offers to show you the market, etc., but the location of the house makes guides unnecessary. Just go to the Kasbah Rose (which you will see on the way to the house), jog left, and go down the stairs. At the bottom, go left on Rue Kasbah in front of the bakery. It is a steep hill, but doable. At the bottom, the park is on the right, and the streets on the left lead into the market (sook). Across from the park on your left, is the Bab Al Madina, a sort of Moroccan fast food place. It is eat in or take out (we did both). The food is excellent and cheap. They also have an outstanding bakery. Watch which way you are going in the sook so you can find your way out. We had no problems. Different streets tend to specialize in different things, such as clothes, food, etc. We found little inclination to bargain on the part of the merchants, but it does not hurt to try. Socialize and be friendly. For day trips (and other taxi rides), Amal has a taxi driver friend Ali who is wonderful. He speaks excellent English, is friendly, and is quite knowledgeable about the history of the area. We hired him for a day to go to Asilah and thoroughly enjoyed him and the trip. For provisions, there are no supermarkets, but there are numerous small shops scattered throughout the neighborhood. They tend to specialize in only a few items, so you may need to look around. You can find about everything in the sook, but you have to then carry things up the hill (or get a taxi). We also ate at the El Morocco (get reservations) and the Cafe Bleu. Both were good. In terms of money, the small merchants want cash. The restaurants were about 50-50 for taking credit cards or requiring cash. Some will take euros. There are several banks along the Rue Kasbah with ATMs, so getting cash is not a problem. Great place. Have fun! What a detailed rendering of your stay in Tangier! I am glad you enjoyed it. I’ll use your description of how to get to the souk in the future. Hope you come again! Repeat renters get 10% off. We were only in Tangiers for two days - wish we could have stayed longer. The house is in a perfect place for exploring the kasbah and the medina and is very comfortable and beautifully furnished. We had a wonderful meal provided one night and were able to eat breakfast on the terrace in the sun. Thank you Plym for your kind review. I am glad you liked the house and hope you will come back soon. To live in a privat house in the Kasbah of Tangier was an exciting experience. The house is very spacious, good equipped, nicely decorated and very clean. There is a lot of privacy also for six people (we are only two). Our favourite place was the terrace overlooking Tangier. We had good luck with the weather and could use it daily. The housekeeper Amal was very friendly and made us our breakfast. She asked for our needs and was helpful by calling a taxi back to the Airport. The contact with Joelle was also enjoyable and the booking was easy. She gave us a lot of helpful tips to plan our journey. Thank you again. We rented a car for four days. A safe parking place (for a fee) is around the corner. You can see it right hand looking from the terrace. We felt save at any time. The neighbourhood is very friendly. We highly recommend this house. Thank you so much Christa. I am so glad you liked the house and Mal and I contributed to the enjoyment of your stay in Tangier. Hope to see you again. Très joli appartement, spacieux bien placé et d'une propreté parfaite. Superbe décoration marocaine et toit terrasse à savourer sans modération. Merci à la gardienne, très accueillante qui nous a préparé de délicieux petits déjeuners. La communication avec la propriétaire est excellente. Petit point de vigilance pour les personnes ayant du mal à se déplacer, il y a beaucoup d'escaliers. Je recommande sans hésiter. Merci beaucoup pour cette appréciation. Je suis ravie que vous ayez aimé votre séjour à Dar Détroit et espère vous y revoir dans un futur proche. Nous la conseillons à tous les futurs voyageurs pour découvrir Tanger dans une ambiance orientale de rêve. Merci beaucoup pour cette appreciation élogieuse. J"apprécie beaucoup car j'essaie de satisfaire les personnes qui me font le plaisir de choisir ma maison pour leurs vacances. Cela fait toujours plaisir de savoir que la maison a été appréciée et que tout s'est bien passé. Maison très agréable à vivre et très bien située. La propriétaire est vraiment à l'écoute des besoins et partage ses précieuses recommandations/coups de coeur dans la ville de Tanger et ses environs. Merci beaucoup pour cette appréciation. Je suis ravie que vous ayez aimé la maison et espère vous y revoir à l'avenir. Vous bénéficieriez de 10% de rabais de fidélité. Tangier is located in northern Morocco, to Spain which it is separated by the Strait of Gibraltar and distant of fifteen kilometers. The city is composed of several hills overlooking the Mediterranean Sea and Atlantic. It is framed by two caps between which the port of Tangier is located, place of arrival of Ferries from Europe and a small fishing port. The view of Spain is spectacular and unforgettable sunset. There are numerous beaches including the main beach of the Bay of Tangier in ten to fifteen minute walk away and the beaches out of town a few kilometers to the Mediterranean to the east or west Atlantic drive away. Getting to Tangier is to dive into a world of colors and bewitching scents. The beauty of the city overlooking the bay and the two seas make it an unforgettable and fascinating city. The kindness of Moroccan and gentle but invigorating climate pleasant temperatures even in summer complete this table. We never forget Tangier. It attracts you and retains more than one for centuries. There are many restaurants both of local cuisine and other countries, reflecting the international character of the city. The recently refurbished Casbah Museum contains treasures of ancient Moroccan art. The medina offers a varied and colorful shopping as abundant and the fish and fruit and vegetable markets abound with fresh products, including those brought by the Berber women of their mountains.